Colors: Green, Yellow, Blue, Pink, Orange, White, etc. Accentuate the positive! This over sized white barrel highlighter has an extra large imprint area and a unique twist action design. The Bullet offers 3 bright, fluorescent inks that have transparent, read through color and are bold enough to highlight important text. Non-Toxic. 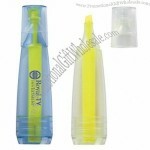 Double take pen highlighter with ballpoint pen. Available in 6 trim colors individually or as an assortment, see colors below. Yellow highlighter with black ink, medium ballpoint. Packaging: Bulk; Units/Ctn: 200; Weight/Ctn: 6 lbs. 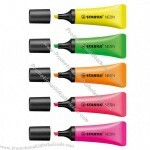 New modern highlighter in tube design with soft surface for comfortable handling. Fun for all ages! 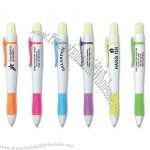 Particularly great for students, these custom highlighter/pen combos with put a smile on your face. Take notes, highlight passages, and keep your screens clean all with one convenient tool. 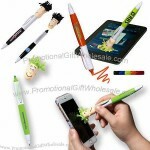 A click-action ballpoint pen and chisel tip highlighter with smiley face, tie-shaped clip, and mop-top microfiber hair for screen cleaning. ABS plastic. A four color highlighter set with a computer brush on a smiley face. Each limb is a different color. The Digital Direct Printing process allows for a Bright and Colorful Eye-Catching Impression. The New Tutto Multi-Function Pen Offers Fresh Styling And Erasable Ink! A Full Colour Imprint Is Available- Call For Pricing. The Innie's dual highlighter makes high lighting notes cool with its sleek and easy to hold design. Includes two coordinating highlighter inks. Oval double highlighter. White case. 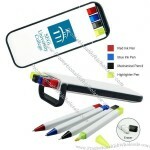 Perfect for conventions, trade shows, school orientations, health fairs, and recruiting events. 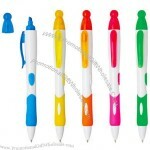 Each set has a black mechanical pencil, blue ball pen, red ball pen & yellow highlighter. The High Styler Highlighters are the ultimate stationery fashion statement. A perfect present for the fashion conscious, with very important information that needs highlighting. 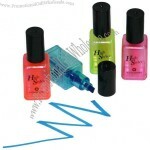 The pack of High Styler Nail varnish Bottle Highlighter Pens contain 4 different coloured, bright and colourful highlighters, design to look like classic nail varnish bottles. Bring a little ZING to your notes and a smile to your face with these highlighter pens using either orange, blue, pink or neon yellow. 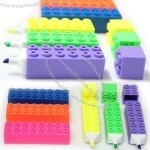 Size: Pack of four highlighters. Each bottle is 7cms (3 inches) tall. 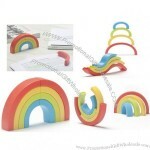 Available Colors: Solid: Pink, Green, Blue, Orange or Yellow. 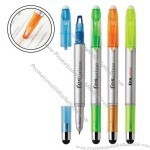 Two-Tone: White with Blue, Orange, Pink, Green or Yellow Trim and Highlighter. 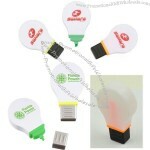 Imprint Area: 1" x 1"
Gain attention from clients when you display your custom imprint on our Light Bulb Hightlighter! 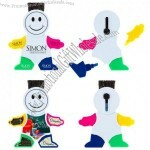 Features a large imprint area to highlight your personalized message or logo. 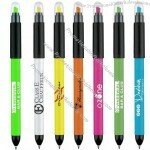 Let these famous Highlighter pens represent your mark! Your clients and partners will have a fabulous time with these standard 80's riddles. 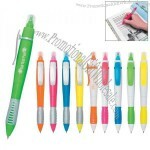 You can buy these pens in three highlighters, in colors of green, pink as well as yellow, all having remarkable marking space. 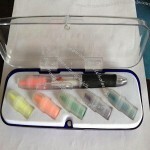 These Highlighter pen sets are a novel route to raise brand attentiveness as well as by the exact nature of the items will stay on your clients' work areas for numerous months to come. The Highlighter pens comprises of a set of 3 markers that copies as an astute confound because of its attractive framework. 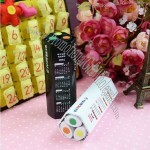 Custom-made Highlighter Pen From China Factory, Low price Highlighter Pen, Top Quality, True wholesale source for original!